The weather this spring can best be described as schizophrenic. It thinks its spring one day and winter the next. Putting smiles on our faces, sunlight warming our way through the day – then within 12 hours strong, cold winds bring us back to the reality that we live in South Dakota! The state where spring blizzards are more expected than not. Because of this, last year, when I was shopping and saw beautiful, lush ferns for $15, I didn’t buy them. 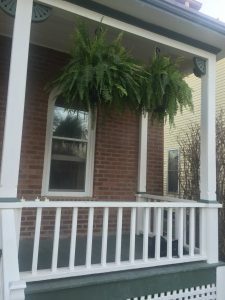 By the time the weather was nice enough to actually hang the ferns on my front porch and leave them there, not a fern could be found – affordable or otherwise. 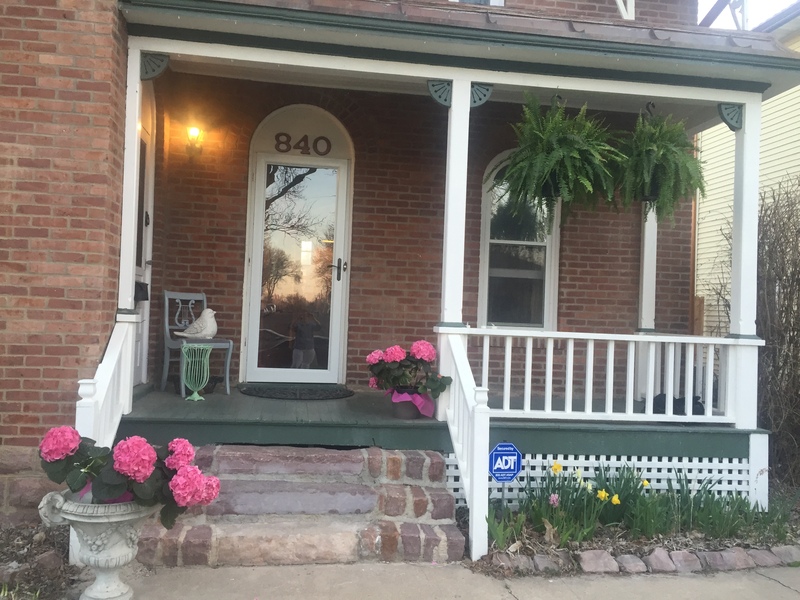 Believe me, I called all the landscape centers in Sioux Falls, visited the big box stores that typically carry low cost ferns – and couldn’t find any. In the end, I was able to get two sorry looking ferns at discount from the floral department of a local grocery store, but even with fertilizer and care, by the first fall frost they still looked weak. So, the other day when I was grocery shopping and ran across $15 ferns at Costco – I asked Parker to hop out of the cart and loaded our cart with two HUGE ferns. Like the hydrangea I purchased in March, I bring them in each night. I figure the extra effort will be well worth it when the stable days of May arrive. 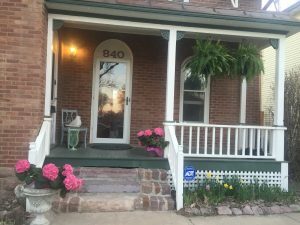 I’m trying my hand at blogging again. About a year ago I put every project that wasn’t essential on hold when we experienced a scary and very sad event – a ruptured, ectopic pregnancy. It opened my eyes to how truly fragile life is – and how blessed I am to have the husband, daughter, family, friends and community that I do. It also closed a chapter in my life’s story. We moved beyond trying to expand our family to embracing parenting our only child, Parker. 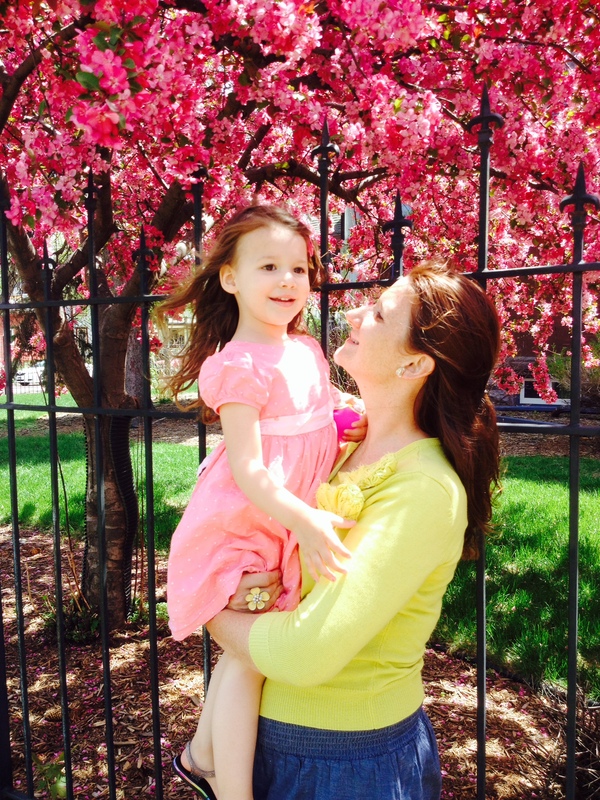 Lura “Parker” is 5 and so much fun! Although I have relished every stage of her existence, now that I know I will only experience the parenting journey once, I somehow savor our time together even more. Leaving one plan behind and moving on with the next has not been easy for me. I’m a goal-orientated, driven individual who loves The Plan and likes to see plans through. But, now that we have decided and I’ve wrapped my head and heart around our decision to raise only one child, I can honestly say I am at peace. I am content, happy and have more energy than I’ve had in years. Although the ruptured ectopic pregnancy is the event which closed this chapter, it wasn’t the only event to precipitate it. We have experienced four miscarriages. And, like the ectopic pregnancy, there is no known medical reason for these. Again, because of who I am and my desire for answers (which serves me well as a journalist, but can drive my inner-mind bonkers!) it was not easy for me to accept this. And that’s OK. I do have a strong faith. I do know that there are many unanswered questions out there. And, I know that if I focus on those, I won’t have the time or energy to BE PRESENT. Coincidentally, being present in every aspect of my life became a mantra of sorts for me a few months prior to our loss. I worked to multi-task less and engage more as a wife, as a mom, a friend and as a professional. I was furious with the fact that losing more than a liter of blood to internal bleeding when my fallopian tube ruptured, literally took two months of my life away. It turned a sad event into a survival event. For those eight weeks it was all I could do to complete work. I spent every free moment sleeping and barely parenting. My husband, Shon filled the void – and I don’t think Parker noticed. Once my iron levels returned to normal and I could truly live again, I determined to not waste one more day. And, I have not. By September it wasn’t work to feel good – physically, mentally or spiritually. I even had extra reserves and began working out. One day in January it donned on me, I had my life back. I was truly living again. Today, almost a year later, I know I am blessed. Not only with my health, but the health of my daughter and husband. Throughout the dark days, my family and friends took care of me. I am grateful, healed and looking forward to writing many new chapters in my life’s book.